Hello everyone. Happy Monday. Today I have a card for you made from our summer fun kit. Now, this is not material that I would normally use, but Susie insisted that we all try to do something out of our norm. 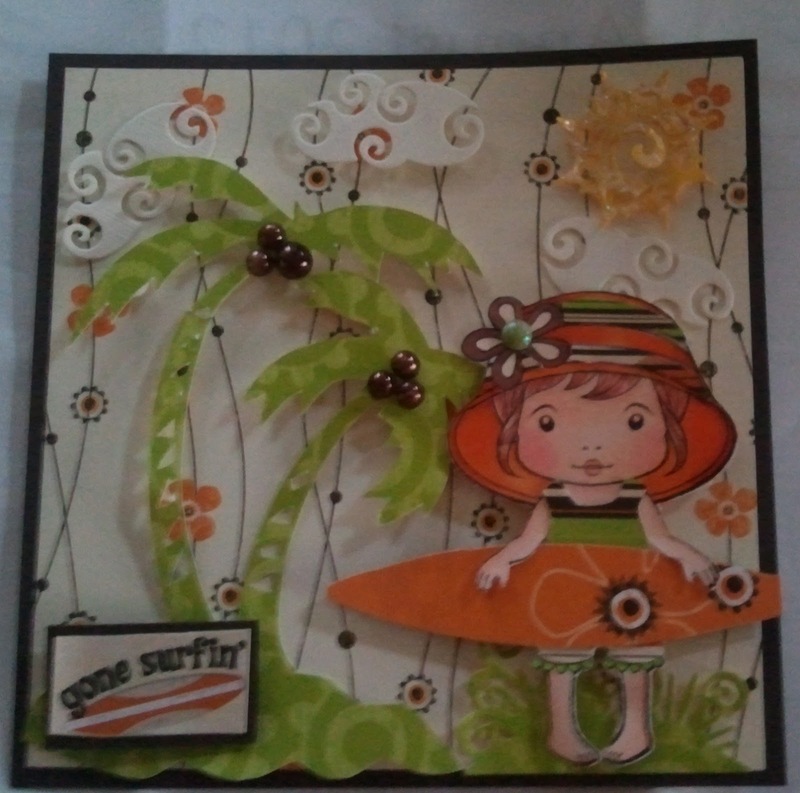 So of course I made a card with Beach Marci from La-La Land Crafts, but I changed her a bit. I paper pieced her bathing suit and hat (not any easy feat, believe me). I colored her with my Copics. On her hat is a Peebles Candy Dot in green (which can be found at Scrap Happy. The dies are from the Cloud, Sun and Island Set from La-La LandCrafts. The palm tree I cut out from my Silhouette Cameo (love that machine). The coconuts are pearls that I colored brown. I used Star Dust Stickles on the sun to make it shine. I hope you enjoy my Beach Marci as much as I did making her. New stamps and dies are arriving for Halloween, Thanksgiving and Christmas. You don't want to miss out, exclusive to Scrap Happy. Until next time, have a happy day. Awesome, I love it, the papers are wonderful. Great coloring too. This is a beautiful card. Love the layout.